Mayor Steve Hagerty and assistant city manager Erika Storlie discuss a cost increase for Robert Crown Community Center. Aldermen and staff brainstormed new revenue options and looked at potential health issues with crumb rubber turf. Aldermen and staff discussed a $4.5 million increase to the cost estimation for the Robert Crown Community Center and looked ahead to new sources of revenue at Monday’s City Council meeting. The total budget estimate is now $52.9 million, assistant city manager Erika Storlie said. She said the timeline for the project remains the same, with construction scheduled to begin this summer and the initial opening set for fall 2019. Barring any major changes before June, $52.9 million will likely be the maximum price for the community center, Storlie said. The cost increase comes from several new developments, including a steel price increase, new knowledge surrounding the poor soil at the site and a new $1.4 million owner contingency added to the city’s contract with Bulley & Andrews, the site’s construction manager. 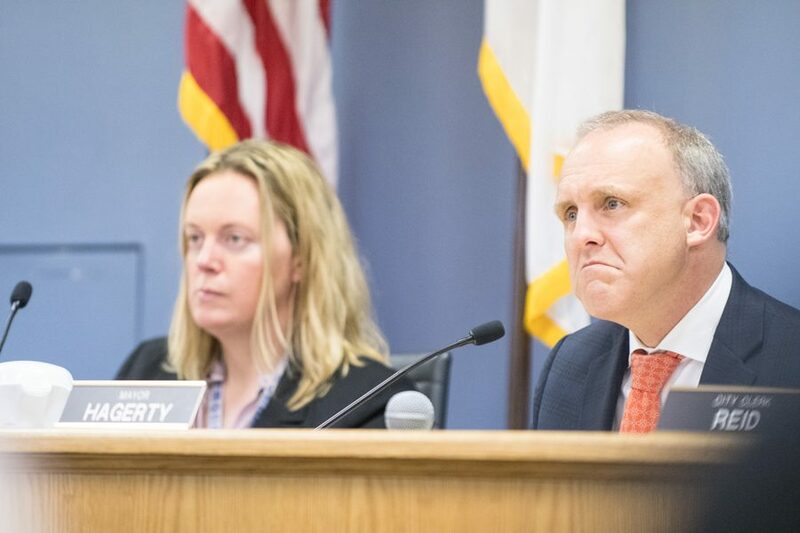 Mayor Steve Hagerty said investing in a project like Robert Crown was important for Evanston, and he urged the council to continue searching for creative forms of revenue. Friends of the Robert Crown Center, an organization dedicated to raising money for the project, updated City Council on its own fundraising efforts — which representative Pete Giangreco said have been very successful. Storlie noted the work of FRCC will offset the $4.5 million cost increase. Giangreco said that between now and the end of the year, FRCC will meet with potential donors and will host an event June 22 to celebrate the groundbreaking of the site. Just one day after sending out invitations, the event has reached more than half of its $250,000 fundraising goal, Giangreco said. In addition to brainstorming forms of revenue for the project, aldermen also discussed the controversy surrounding the potential health ramifications of turf fields, an issue undergoing investigation by the U.S. Environmental Protection Agency. The Robert Crown plans include three turf fields, which Storlie said would be the first turf fields owned by the city. The fields would be multipurpose, suitable for a number of sports including soccer, baseball, football and lacrosse. Artificial turf was chosen because of the maintenance challenges of grass fields such as canceled games and rain damage, Storlie said. Despite their convenience, crumb rubber turf fields are under national investigation for a possible link to cancer, Evanston resident John Kennedy said during public comment. Kennedy said his daughter played soccer for years at ETHS before going to college and playing on turf. He said when she came home during her sophomore year, she was diagnosed with cancer. “As of 2017, 237 soccer players (and) football players had come down with cancer after playing on artificial turf,” Kennedy said. He specified that a causal relationship has not been proven but said correlation is dangerous enough to require action. Kennedy said his daughter is currently healthy, but he urged City Council to invest in something other than crumb rubber turf. Engineering and capital planning bureau chief Lara Biggs presented turf options to aldermen, the cheapest of which was crumb rubber. Biggs noted that the EPA is investigating the controversy around crumb rubber and is set to release its results early this summer. Hagerty and the rest of the council were unequivocal in their decision to adhere to federal findings. Staff and aldermen will continue to brainstorm revenue options and look into different forms of turf, Storlie said.